The course at Taiwan G&CC is laid out in undulating woodland. The century-old dense forest is positioned on both sides of the fairways. 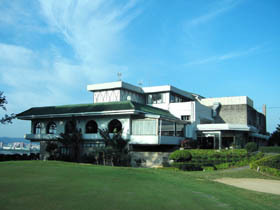 This oldest course in Taiwan is popular as its nickname, Old Tamusoi Course as the golf club is located at Tamusoi. Established in 1914 with only 3 holes, it finally developed into 18 holes in 1929. It wasn’t until a Japanese course architect, Shiro Akaboshi redesigned and overhauled in 1936 that it became a full-fledged championship course. Accurate iron shots are necessary through the course as the greens is generally small and severely guarded by bunkers. Taking the strong sea winds, sweeping from Taiwan Strait and the river mouth, into consideration, a solid course management is also required for a good score. All four par 5s are well designed. The sixth hole is a straight, downhill, and signature hole. Players will have to be careful when approaching the green at this hole as their plays are severely affected by sea winds as Tamusoi River mouth is just located behind the green. The players will hit the approach shot from the downhill lie onto the green heavily guarded by bunkers. The seventh hole is a par five with a slight uphill dogleg to the left. Due to the tight fairways flanked by tress, both the tee shot and second shots will have narrow landing areas. An OB line on the left will come into play, too. Nevertheless, players will enjoy the views of the hole seen from the green and Tamusui River mouth. The 8th hole is a par three that is surrounded by the forest. The hole has a beautiful garden style design. The high-rise buildings can be seen from the tee and are laid out side by side. These buildings give a nice contrast between nature and civilization. The 9th hole is a straight and relatively long par four. While distance is necessary on the tee shot, the tight fairways, which are squeezed by trees on both sides, will force players to decide whether accuracy or a big drive is more important. The greens are guarded by four bunkers, making an accurate & long approach shot is required. This long and challenging par three that is filled with deep bunkers on both sides. Players should note that because of the prevailing against winds, the actual distance is longer than what they think. A pond located close to the left edge of the green will also catch your errant shot. Furthermore, the green is elevated. Both accuracy and distance are needed on this demanding hole. A generally straight and short par four. The green slopes heavily form back to front and is guarded by a pond nearby. A par five with a slightly right dogleg with an OB line on the entire left side. The landing areas on the tee and second shots are small due to the tight fairway flanked by trees. The flat green is surrendered by three narrow bunkers. A slightly uphill & almost straight par four. Driving towards the right side of the fairway will leave players a good position to hit the green on the approach. However if the ball goes too far right, a tree in front of the green will become stymie. The large green is surrounded by seven bunkers. To get to Taiwan G&CC, it is about a 40-minute drive from Taipei city and an hour from Chiang Kai-shek International Airport. This course is notoriously known for having produced some of Taiwan’s most famous golf pros such as Chen Ching-po, Hsieh Min-nan , Lu Liang-huan, Tu Ai-yu , and Ming-Yeh Wu. These are players who were all active in Japan’s PGA. Other courses that Siro Akaboshi has designed in Japan are Kasumigaseki CC (East), Abiko GC, Hodogaya CC, Keya GC, Hakone CC and so on.